Modern offices are intended to be monuments to collaboration that transcend seniority, gender, ethnic identity, social identity, and job function. This workplace Shangri-La is of course the open plan office, which supposedly eliminates barriers between employees to enhance creativity as multiple points of view are efficiently funneled into a better version of company culture and its product or service. Yet mounting evidence suggests that this is not what the open plan office delivers in reality. What has gone wrong with the supposed work environment of the future?Modern offices are intended to be monuments to collaboration that transcend seniority, gender, ethnic identity, social identity, and job function. This workplace Shangri-La is of course the open plan office, which supposedly eliminates barriers between employees to enhance creativity as multiple points of view are efficiently funneled into a better version of company culture and its product or service. Yet mounting evidence suggests that this is not what the open plan office delivers in reality. What has gone wrong with the supposed work environment of the future? Physical health: Simply put, researchers have found that, not surprisingly, disease spreads more quickly in open plan offices, leading to more sick days and therefore reduced productivity. Anyone who has been around teachers in the fall would expect this to be the case – did we really need a study to confirm it? Mental health: Less obvious is that forced collaboration actually seems to increase stress in the workplace rather than decrease it. Dr. Vinesh Oommen of the University of Queensland in Australia concluded in his review of the literature on the topic that “In 90 per cent of the research, the outcome of working in an open-plan office was seen as negative, with open-plan offices causing high levels of stress, conflict, high blood pressure, and a high staff turnover.” Another study published in the Journal of Environmental Psychology found that workers in open plan offices often complain about an inability to focus in these environments given excessive noise and other distractions. Office privacy: Again, in what should perhaps have been a logical conclusion, people tend not to want to share EVERYTHING with their co-workers. The work environment is not a place for radical sharing, and yet the trading floor kind of environment favored by devotees such as Michael Bloomberg or Facebook’s Mark Zuckerberg, whose revamped, single-room office space stretches 10 acres, houses 2,800 employees, and is the largest open floor plan in the world, enforces radical sharing. Privacy goes beyond that needed to handle the occasional personal issue that comes up during the day and extends to many work issues, such as confidentiality concerns or even just the need to work without prying eyes until said work is ready to be formally presented. 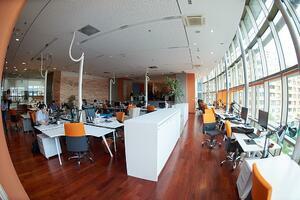 Does this mean that open office plans must be completely redesigned from the ground up? While this might be a good solution at some stage, there are other solutions that can be implemented more quickly and more cheaply than a full redesign. Decorative window film can make glass walls opaque, Casper cloaking film can be used to make computer screens unreadable to anyone except the user, and roller shades and blinds can also be added to glass windows and walls for building privacy. Contact the experts at Signals Defense in Owing Mills, MD for a free consultation. Your employees and your bottom line will thank you for it!